I know there are quite a few posts out there about the famous "Press Shutter Release Button Again" error. But mine seems to be quite weird. I own a Nikon D3200 with the standard 18-55 mm lens. It works great and takes amazing pictures but only if my aperture is fully open (f/3.5). Once I close it to, for example, f/4 it shows me the "Press Shutter Release Button Again" error. The weird part though is that it will take a picture, but the picture will either be way too dark or way too bright depending on the lighting. I checked and the mirror is moving without any issue and the aperture "arm" is also moving freely. I think it might be the lens? I am not sure about this though since I am quite new to DSLR cameras. I doubt that this is normal, don't know if anybody has some advice? When the camera is set at the lens' maximum aperture, the aperture lever does not need to move to stop down the lens, which is being held wide open by the act of mounting it on the camera. So even though the arm is moving when no lens is mounted or when you have the aperture set to a narrower setting than wide open, the error message could be an indication that something is wrong with the aperture linkage. More than one of the answers to How do I troubleshoot the "Error, press shutter release button again" message on my Nikon? suggests oiling the wheel that drives the mirror and aperture levers. This could well be the source of your trouble, or it might be something else. It could also be, as you suspect, an issue with the lens. 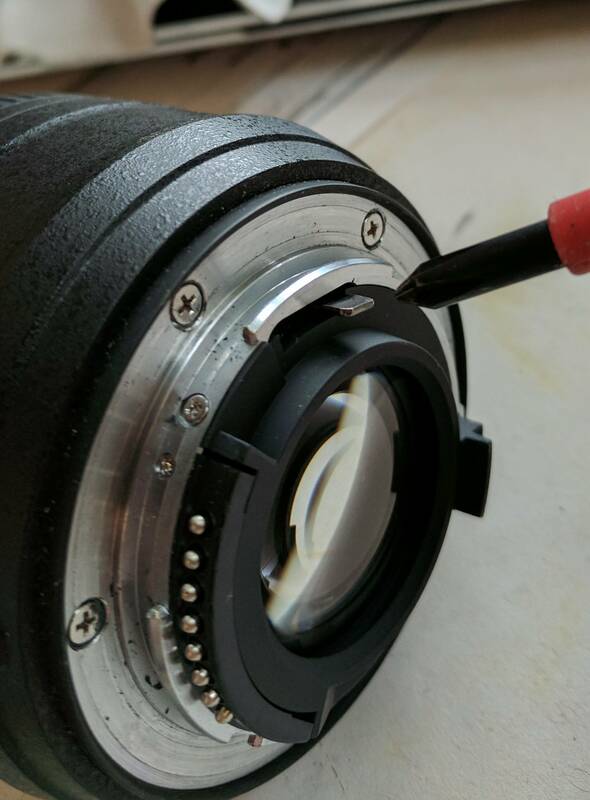 It's time to have the camera looked at by a technician that can diagnose and, if feasible, repair the problem. Well the first thing to do is work out if it's a problem with the lens or the camera.. my gut is that it's the lens and the irises are stuck and I say this because it works fine unless the camera has to "stop down" to a smaller aperture like another poster said. Take off the lens and find this little tab that I'm pointing to with the screw driver. It is spring loaded so with the lens off the camera it should be wide open. If you look through the lens and tweak this little lever you should see the aperture irises snap open and shut. If you can't move that lever then this lens is toast.. and honestly not trying to get repaired because it's so plentiful and cheap used.. better still, buy something better! If it is stuck you've actually nothing to lose by pulling the back off it. It's just a couple of screws. I'd loosen those screws on the back a little until you can get a bit of a wiggle on back plate and see if that unfouls whatever is fouled up on something. If that's moving fine then it's something else, possibly the part of the camera that mates to it. It's at 9 o'clock as you look into the camera with lens removed. I wouldn't mess with that, although you could give it the lightest push DOWN to make sure it actually moves. If it's NOT at 9 o'clock, more like 8, then that's a problem and the tensioner on it might have gone bad. That's the point at which I think DIY investigation comes to an end. If you don't like the look of any of this, find someone else with a Nikon AF lens, and see if the same thing happens - or go to a camera store, tell them you think your lens is bad, and ask to use theirs, and see if it has the same result. Not the answer you're looking for? Browse other questions tagged nikon aperture troubleshooting error or ask your own question. Can I fix my Nikon FE's issue of auto firing after advancing (bottom curtain doesn't come up)? How do I resolve a Canon “error 99” that is not a lens issue?